On the day that a terrible plague ends civilization as we know it, an actor dies onstage during a performance of King Lear. The actor, Arthur Leander, dies of a heart-attack, never knowing that his death day is also the death day of the world. Yet, Arthur Leander is at the heart of this tale. As the Georgia flu ravages the earth, we follow the lives of five characters, all connected to Arthur in some way. By seeing their lives before the Georgia flu, and comparing them to their lives after, we gain an appreciation of what is really important. Miranda Coles starts her seminal work, a two book comic book series titled “Station Eleven,” years before the flu stricks. Miranda, one of Arthur Leanders three wives, never gained any fame or fortune from her work while she was alive. But after the coming of the Georgia flu, her work becomes a vital literary work in the new world. Kirsten, who as a child, watched Arther Leander die onstage, joins the Traveling Symphony after the flu outbreak. The Traveling Symphony brings Shakespeare and music to the communities it visits, and Kirsten finds a new family. The stories of Miranda, Kirsten, and others who knew Arthur Leander weave together to become something greater than the sum of the parts. 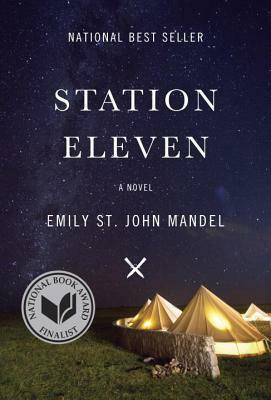 Station Eleven is not a hard-hitting, action-packed dsytopian adventure. Rather, is a leisurely exploration of our world, civilization, and the human heart. A nominee for the National Book Award, this was an enjoyable read.